When we think about spicy Chinese food the first food item click in our mind is the Szechuan recipes such as Szechuan Fried rice, Sechuan Noodles, Szechuan Stirfries..etc. 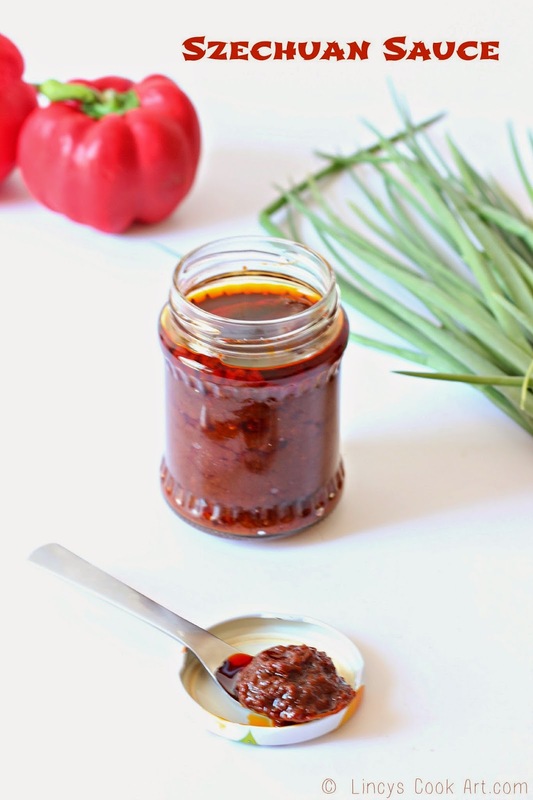 This spicy sauce is so versatile and can be used in many preparations from rice to side dishes like gravies. Initially i was getting ready made Szechuan sauce from super markets and will finish off so soon and wanted to make home made version. So i referred Sanjeev Kapoor Chinese Dishes book and internet to make this sauce to suit my taste buds. This sauce is really fresh in flavours than the store bought one. You could use celery and Szechuan pepper powder instead of normal pepper powder if you get these ingredients or simply omit them in this recipe. In a blender jar add the chillies and grind as a fine paste by adding little water. Heat oil in a pan and add chopped garlic and ginger and cook for about a minute on low flame till the raw smell leaves the garlic should not turn golden colour. If you get celery you can add 2 tablespoons of celery and cook for a minute of two. If you donot get it omit and continue the recipe. Now add the red chilli paste, vinegar and 1/4 cup of water and cook for two minutes till the raw chilli flavour leaves. Now add the tomato sauce and salt and sugar to balance the taste. Allow to cool to room temperature and transfer into a air tight bottle and refrigerate. This sauce wont spoil easily like pickle as the oil floats on top. Useful info..... I'll try this.....and one qn....how long this will last.....I mean in the refrigerator.. ? Like Pickle u it lasts for months as it has oil floating on top of the sauce. Dont worry with in a month it will get finished as it is 250ml bottle. This is very useful to stock in our homes, bookmarking.